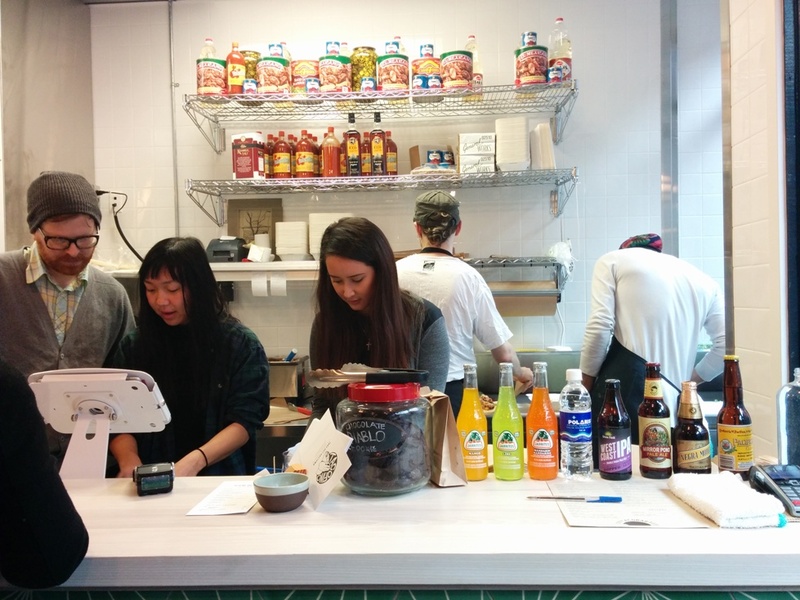 I recently visited the newly opened Tacofino in Gastown. I have actually never tried Tacofino before… They have one side which is a Taco Bar and only open 5pm-12am and a Burrito Bar open 11am-12am on the other side. Since I went for lunch, I didn’t get to try their taco bar but the burrito bar side has one fish taco option if you do go during the day. There was a small counter for ordering once you walk in and there was a substantial line up when I got there. I was tempted to try their gigantic Chocolate Diablo Cookies ($3) sitting in a jar on the counter but I resisted! Despite the long line up, the wait wasn’t too bad and they’re pretty efficient. All their burritos are also available as a bowl for the same price. It just doesn’t feel like a burrito to me if I get it in a bowl though (tried that once at Chipotle when I was trying to be healthy). I ordered the Chicken Kaarage Burrito wrapped in a flour tortilla with chicken karaage, rice, black chili mayo, sriracha, cabbage, cilantro and guacamole. 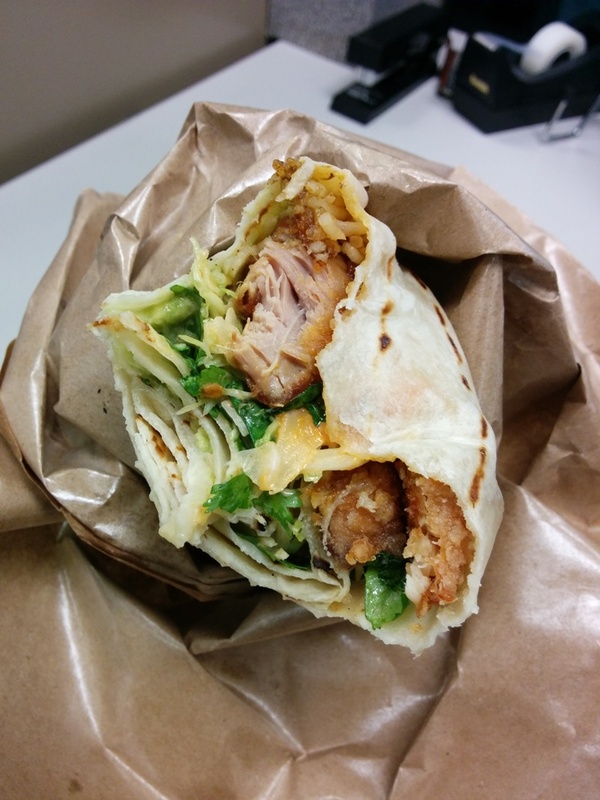 I love chicken kaarage so this Japanese-Mexican fusion burrito hit the spot for me! It was love at first bite. Super crispy chicken was in every bite and the flour tortilla was surprisingly soft but sort of chewy too. The chili mayo and sriracha flavours were subtle but still took the burrito to the next level. Guacamole was mentioned in the description but I didn’t taste much of it. The cabbage and cilantro tasted crunchy and fresh with a hint of lime. If you love fried chicken then this is the burrito for you! Why didn’t someone come up with this sooner? 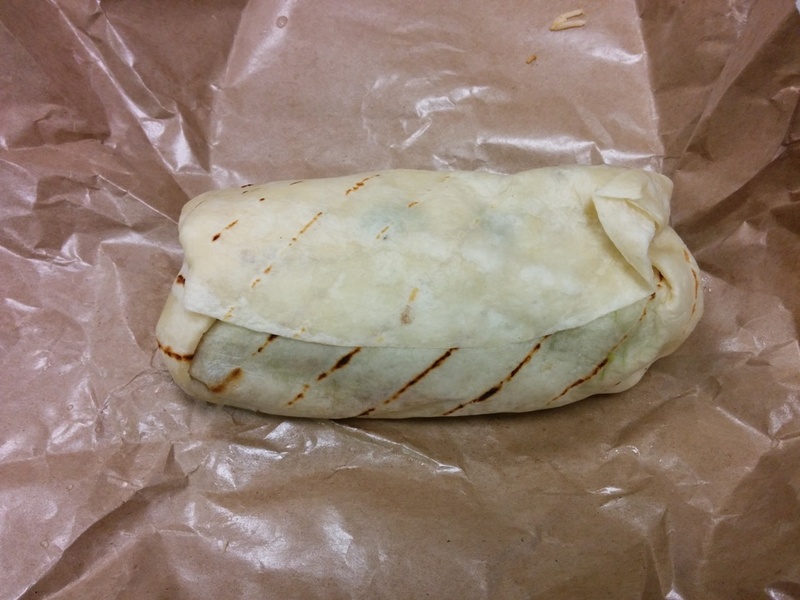 It’s slightly pricier than your average burrito but I thought it was worth it. This entry was posted in Food Reviews, Mexican/South American and tagged burrito, Chicken Karaage, fusion, Japanese, Mexican, sri, tacos.